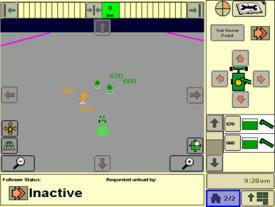 Machine Sync coverage map sharing enables John Deere Section Control enabled machines to trigger section control on/off based upon another machine’s coverage. Sharing coverage maps while seeding, spraying, or applying nutrients allows multiple machines operating in the same field to more efficiently control inputs. Calculation of harvested area also increases accuracy when utilizing coverage map sharing. Machine Sync guidance line sharing enables AutoTrac™ automatic guidance enabled machines to share straight track guidance lines with another machine operating within the same client, farm, field and task. Streamline the process of sharing guidance lines with Machine Sync; simply share the AB line to another GreenStar™ 3 (GS3) 2630 Displays in near real-time. Once a guidance line is received, the line can either be saved for later use, adding the line into the list of available straight track lines or set for use allowing guidance lines to automatically generate and immediately be used. Guidance line sharing is optimized between machines with the same track spacing; if machines have different track spacing, it is recommended to have those machines work different areas of the field. If machines must work in the same area of the field with different track spacing, operators need to use shift track to line up each pass. 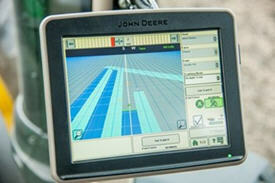 Coverage map and guidance line sharing changes the way operators approach a planting, spraying, or harvesting a field. With near real-time coverage map sharing, machines can plant, spray, or apply in whatever pattern makes the most sense within the operation and automatically command Section Control on/off based upon the other machines coverage. Coverage maps are shared between GS3 2630 Displays operating in the same client, farm, field, and task. Guidance lines of any global positioning system (GPS) accuracy level (SF1, SF2, SF3, and RTK) can be shared between machines; however, accuracy of shared guidance line and coverage maps is related to the StarFire™ Receiver accuracy level. As the accuracy level increases, coverage map and guidance line sharing accuracy also increases. 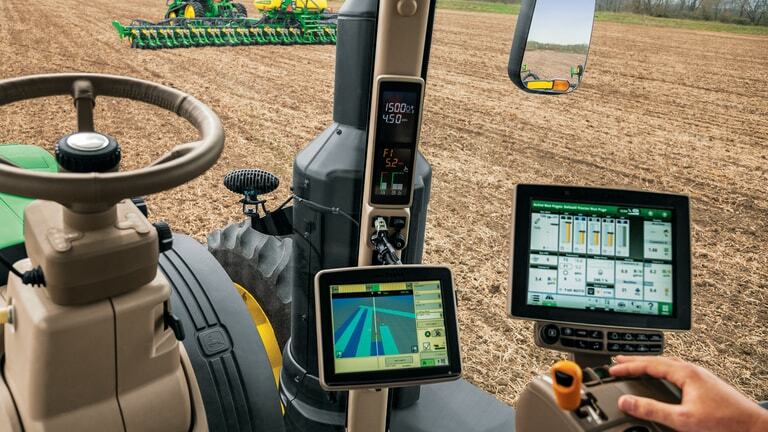 Machine Communication Radio (MCR): When the Machine Sync application is paired with an MCR, coverage maps and guidance lines can be shared between two machines operating in the same client, farm, field, and task. Because the MCR solution creates its own wireless network, cellular coverage and a JDLink™ Connect subscription are not required. Data sharing is limited to vehicles within a 3-mile radius, and line of sight is required between vehicles. MCR hardware is required for harvest automation and logistics functionality. Modular Telematics Gateway (MTG): When the Machine Sync application is paired with MTG 3G or newer communication technology, coverage maps and guidance lines can be shared between two machines in a single Operations Center organization operating in the same client, farm, field, and task. Sharing can occur simultaneously or coverage maps and guidance lines will be stored by John Deere for an additional 14 days. Once shared, all coverage maps and guidance lines are stored on the display until cleared. In the event that coverage map and guidance lines need to be shared beyond 14 days and coverage has not been deleted from the display, reconnect both displays to the same client, farm, field, and task. Since the MTG 3G or 4G LTE leverages cellular communication technology, it allows multiple machines to communicate regardless of the machine’s proximity to the other as long as both are in areas with cellular coverage. A JDLink Connect subscription is required in order for the MTG 3G or 4G LTE option to be utilized. John Deere Machine Sync coverage map and guidance line sharing enhances the efficiencies of operations running multiple machines together. Machine Sync harvest automation makes on-the-go unloading more efficient. Combine productivity relies on keeping the machine running and never stopping to unload. For example, an S-Series Combine operating in high-volume crops, such as corn 6-10 ton (180-220 bu), can expect to be unloading 40 to 50 percent of the time. A producer could spend over half of a harvesting day with the unloading auger on. John Deere Machine Sync enhances the harvesting experience for even the most experienced operators. It allows both operators to focus on the key tasks of harvesting and unloading while minimizing the additional tasks created by on-the-go unloading. This results in operators who are more relaxed, productive, and alert while farming. To utilize Machine Sync in a S700 Series Combine with an integrated 4600 CommandCenter™ Display, a GreenStar™ 3 2630 Display and Machine Communication Radio (MCR) must be used. John Deere Machine Sync provides valuable information that allows multiple tractor/grain cart operators to make decisions that save time, fuel, and reduce compaction. A complete logistics view is also available to combine operators showing every combine and grain cart in the network. John Deere Machine Sync’s logistical information enables tractor/grain cart operators to best determine what combine will need to unload first. This reduces the amount of time a combine waits for a cart and reduces unnecessary idle time. This information can also be helpful in managing transportation requirements. The combine operator also has the ability to send out a request to unload. 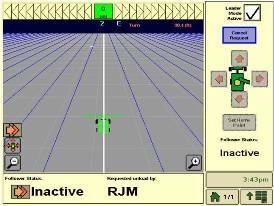 This allows the combine operator to influence the tractor/grain cart operator through the display. It is no longer necessary to solely rely on hand gestures or mobile phones to communicate an unload request. Pair coverage map sharing with harvest automation and logistics to gain additional efficiencies. Enabling the grain cart with coverage map sharing allows the operator to see headlands and areas of the field that have been harvested, allowing them to plan the most efficient way to access combines operating in the field. The automation and logistic information provided by Machine Sync is made possible with the John Deere Machine Communication Radio. The network can include a total of ten machines, with any combination of tractors and combines. The MCR creates a network between the fleet of tractors and combines, allowing the display to show logistics information and allows for the automation between the combine and tractor. Combine operators, once paired with a tractor/grain cart, can also control the tractor's speed and nudge the tractor forward, backward, or laterally to maximize the filling of the grain cart. 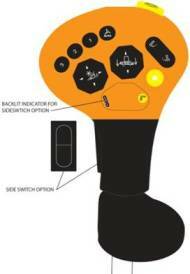 This control offers a significant reduction in stress to the combine operator. John Deere Machine Sync guides an approaching grain cart tractor to a predetermined position for unloading relative to a specific combine. This synchronization occurs once the tractor and grain tank enter an area to the left of the combine. This area is known as the operational zone, which is the orange box in the display image pictured above. Once in the operational zone, digital radio communication commences between the two machines. 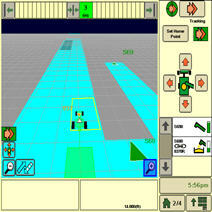 At this point, the tractor operator can engage Machine Sync by pressing the AutoTrac™ assisted steering resume switch. 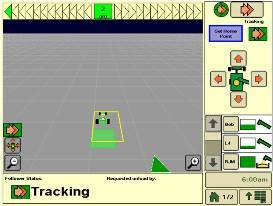 This gives control of the tractor, including speed and direction of travel to the combine operator. Once the tractor reaches the predetermined unloading point or home point, synchronization occurs between the two machines. As the combine continues to harvest, the combine operator can engage the unloading auger, offloading grain into the grain cart. While synchronized, the tractor and grain cart are mimicking the movements of the combine. The combine and tractor with the grain cart continue to travel in synchronized fashion until the combine or tractor operator disengages Machine Sync. 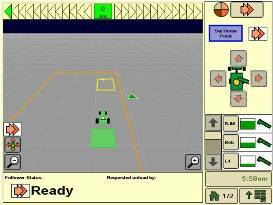 The tractor operator can do this by simply taking control of the steering wheel. The combine operator can disengage through a button on the GreenStar™ 3 (GS3) 2630 Display. Machine Sync will automatically disengage at speeds below 0.5 km/h (0.31 mph) or above 16 km/h (9.94 mph). While the combine and tractor/grain cart are tracking and unloading, the combine operator has the ability to make incremental speed and direction changes to the tractor to evenly fill the cart. Nudge buttons on GS3 2630 Display allow the tractor/grain tank to be nudged forward, backward, or side to side. These changes in relative positioning help ensure the full capacity of the grain tank is being utilized. Final topping off of the grain cart may require the combine operator to swing the unloading auger for final filling. With W-, S-, and T-Series Combines, an optional field-installed hydro handle with an integrated nudge button is available. The John Deere Machine Communication Radio paired with the Machine Sync activation for the GreenStar™ 3 (GS3) 2630 Display synchronizes the movement between the combine and tractor/grain cart, providing automated on-the-go unloading during harvest. 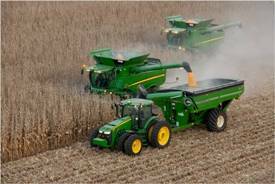 A network consists of up to 10 machines, with any combination of tractor/grain carts to combines.